The popular revolt against the incompetent Morsi government was inspiring—but the coup that followed sets a dangerous precedent. Two and a half years ago, the people of Egypt rose up against a despised dictatorship. The immediate goal was to get rid of the Mubarak regime, of course, but they were also fighting for something much more important: bread, freedom and social justice. On June 30, in a petition campaign organized by the Tamarod (Rebel) movement, millions of Egyptians—in even greater numbers than in January 2011—rose up once again. The cry on the streets, this time lodged against an arrogant and grossly incompetent Muslim Brotherhood government, was Irhal! (Leave! ), but the deeper demands were the same as before. It would be a mistake, though, to see the coup as the death of Egypt’s revolution. That revolution has barely begun. None of the changes over the past two years have reformed the state led by Mubarak, nor have they allowed development of an institutional alternative to the army as the most powerful force in Egyptian politics. In fact, one constant since January 2011 has been the persistent power of crony capitalists and the military, often referred to as the “deep state.” From the beginning of the January uprising, the Brotherhood was careful never to challenge their dominance, and after his election last year, Morsi assiduously protected the army’s powers, ensuring, in the Constitution he rammed through last fall, that it would continue to control its own budget. The Brotherhood leadership, dominated by wealthy businessmen, also has no complaint with the neoliberal economic “reforms” called for by Washington and the IMF that have impoverished so many Egyptians, and it has been a consistent enemy of labor and the working class during its year in power. So why the coup, if the army had no serious structural complaints against the Brotherhood’s fig-leaf government? Because the massive protests made it clear that Morsi had lost legitimacy with the public. Just as it did with the January insurrection against Mubarak, the army is riding the tiger of popular revolt, only this time its public relations, if not its actual practices, have been more adroit. That also explains the ambiguous US response: Washington counseled acceptance of Morsi’s government this spring because it knew he wouldn’t challenge fundamental US interests. And it has quietly accepted the coup for the same reason: the Egyptian army is, after all, one of Washington’s oldest and most reliable allies in the Middle East. If the reactionary Gulf regimes of Saudi Arabia, Kuwait and the United Arab Emirates saw no need for scruple in expressing joy at the Brotherhood’s downfall, quickly promising billions in aid to Cairo, Washington at least needs to pay lip service to democratic principle. But make no mistake, the United States has been the most crucial external bulwark of the deep state for three decades, having lavished tens of billions on Egypt’s bloated, deeply corrupt army, which controls some 20 percent of the country’s economy, perhaps much more (many of its holdings are state secrets). It’s one of Egypt’s largest landowners, and top generals have for many years profited immensely from sweetheart contracts and kickbacks. Through both Democratic and Republican administrations, Washington has furthered a narrow set of strategic interests in its relations with Egypt: primarily continuance of the peace treaty with Israel, along with Cairo’s assistance in the “war on terror” and the opening up of Egypt’s economy to international investors through the bludgeon of structural adjustment. It has never shown much concern for the Egyptian people. That cannot continue. The army and the remnants of the old regime may have rebooted their dominance, but it’s still early days in the struggle for Egypt’s future. Egyptians have shown remarkable courage and endurance, rebelling repeatedly these past two and a half years, first to oust Mubarak, then to protest army abuses and massacres, more recently to reject the feckless Morsi regime. It would be foolish to presume that they will not rise up again, and that they will not keep an account of who stood with them, and who stood with their oppressors. The prudent path for Washington is also the most ethical: we should phase out our subsidy of the Egyptian military and, working with European and other sympathetic countries, vastly increase economic aid. That’s the best way to support freedom and social justice. 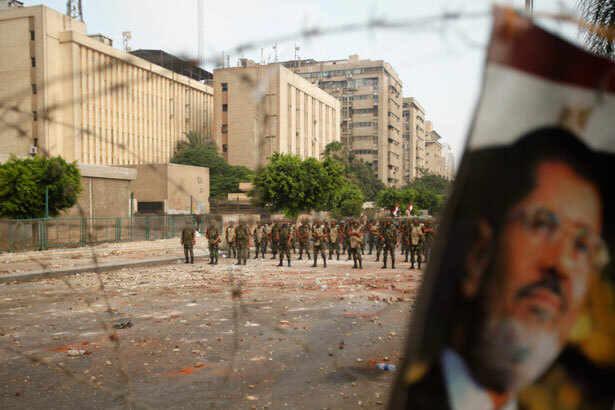 Earlier this month, Sharif Abdel Kouddous looked at what led to the fall of Egypt’s Mohammed Morsi.